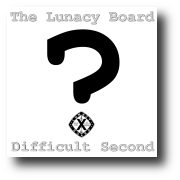 This just about marks the halfway point of the Album-a-Day project, “Difficult Second”, and I’m pleased to say we have an album’s worth of material. It is perhaps a little rougher around the edges than our usual fare, but such are the constraints of time under these circumstances. I’m pleased to say that we’ve already had some submissions from some of our previous collaborators, Beat Frequency and Wilco Botermans, which will be included in the tracks already recorded, and hope to have some more by the end of the 24 hours. Having been out last night until 4am doing live sound at a wedding, I’m feeling more than a little tired, but now comes the time to sit down and work through the various takes we’ve had at the new songs and instrumentals, adding the occasional overdub and getting the final article into a shape worthy of the Board. In just over 12 hours you’ll be able to download the album for free and hear the full effect of our labours. Finally, apologies for the lack of sound on the webcast – it was working this morning, but the PC froze and now I can’t seem to get the sound back. you’re still welcome to drop by and watch or chat!